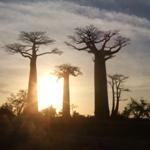 The’ Hotel Palissandre Côte Ouest Madagascar is located at Nosy Kely on the beach of Morondava, to 30 minutes of the mythical Baobabs Alley. An ideal place to relax or from which to attack the Tsingy du Bemaraha ! The Hôtel Palissandre Côte Ouest offers 30 bungalows built in materials from Madagascar : granite stone, palissandre wood and roof mokotry. 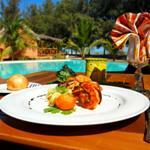 They are spacious (32m2) and all have a private terrace with sea view. 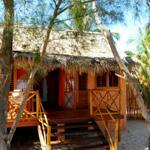 In each bungalow, you will find a very comfortable very popular in such a remote corner of Madagascar. The Palissandre Côte Ouest also offers a lovely pool located next to the bar and restaurant (whose head has worked in several great restaurants in Antananarivo). Guests can enjoy massage spa, this including your return from the long road Tsingy… bliss ! 30 Bungalows de 32m², with private terrace and sea view, comfort and refinement in Malagasy tradition, scattered in a coconut grove.